What does it mean to be defiantly joyful in this moment when I am dwelling on the ancient path of shame and disappointment in myself? Those paths are made of quicksand. My friend Lisa Beck says that God planned our rescue before we even knew we were in trouble. I’m in trouble. I know it now. And the temptation is to hate myself for it. Do you know this place sometimes? Did you get irritated with your spouse this morning over some silly thing and speak to them with a stinging contempt no one deserves? Did you buy that alluring thing when you had pledged to stay within your budget? In fact, left alone, the little hard kernel of self-judgment grows like an aggressive cancer, wreaking havoc in my life. The small stone becomes a massive rock that is too large for me to move. But God—still two of my favorite words—but God is in the business of moving stones. There is no ancient, grave-sealing, love-blocking weight that He cannot overcome. And I have a part to play. So do you. The core of my heart needs to align with the truth that judging myself harshly is neither my right nor even remotely godly. God has asked me to renounce self-judgment, so, as valid as it feels, I am obeying. Renouncing judgment breaks the painful claim of hatred I’ve imposed upon myself and allows love to come in. It allows grace to come in—both for me and for others. Rather than becoming prickly and defensive, I give up my position as judge and hand it over to the One who is the rightful Judge, Jesus Christ. If He can forgive me and love me, well then, who am I to withhold love and forgiveness? I must choose again in this moment to surrender to God. I have to choose to believe Him and all the incredibly marvelous things He says about me and feels toward me. And with that, my heart rises. The chains of self-contempt are shattered by His never-changing grace and give way to the holy chords of singing repentance. Conviction takes the place of condemnation, and I walk into the joy of the prodigal being embraced by the Father. He has not turned His face away. He has been waiting, waiting and watching with keen eyes that have beckoned my return all along. I choose to return and raise the gaze of my soul to His ever-kind face. He has not been judging me. He has been wooing me out of my sin. Click here to listen to this week's podcast Cultivating Joy. 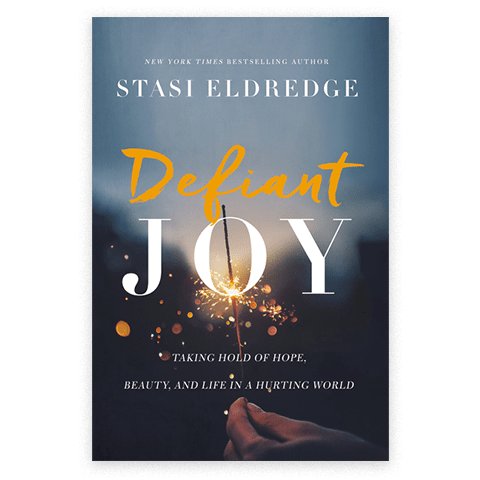 Stasi invites her friend Julie Goulter into the studio to discuss how Defiant Joy involves interpreting both goodness and grief in our lives by the light of heaven.